Welcome to the Feed Zone! The Feed Zone Series of cookbooks by Dr. Allen Lim and chef Biju Thomas have revolutionized how cyclists, triathletes, and runners think about food and sports nutrition. 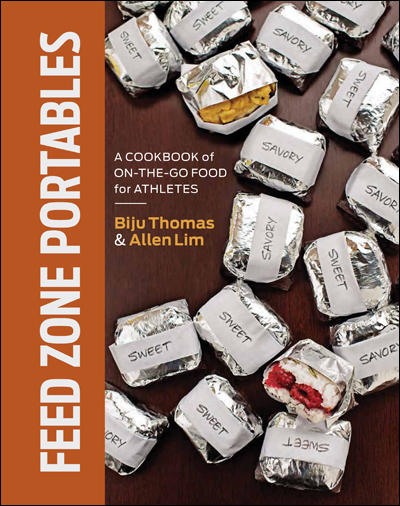 In their best-selling cookbook for athletes, The Feed Zone Cookbook, Dr. Lim and chef Thomas offer 150 athlete-friendly recipes that are simple, delicious, and easy to prepare for breakfast, lunch, dinner, portable snacks, drinks and desserts. This cookbook showed busy athletes that they can cook great-tasting meals for every meal of the day. Feed Zone Portables is an ingenious collection of 75 portable snacks tested with elite athletes for flavor and function during exercise, These easy, healthy portable snack recipes taste great during exercise and fuel athletes so much better than packaged sports nutrition products. Athletes don’t have to eat alone. Science shows that it’s not just what we eat that matters but how we enjoy meals with friends and family. Dr. Lim and chef Thomas explore the new research on social eating in Feed Zone Table, which offers 100 recipes to bring friends and family to the table in a way that nourishes life and sport. Here on feedzonecookbook.com, we offer a sampling of free recipes from the Feed Zone Series. We hope you enjoy them! And if you do, please show your support and purchase the cookbooks from SkratchLabs.com, VeloPress.com/feedzone, or from your local bike shop, running store, or bookstore. For more excerpts and sample recipes from the Feed Zone Series, please visit velopress.com/feedzone.